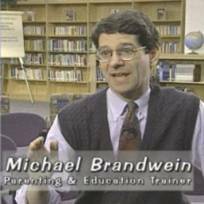 These are three 27-minute television programs on one DVD, written and presented by Michael Brandwein and broadcast on PBS stations throughout the U.S. These shows are for ANYONE WHO WORKS WITH YOUNG PEOPLE of any age, including camp leaders, teachers, parents, youth leaders, and others. The shows feature a combination of mini-workshops in front of a live audience presented in brief segments, ideal for "start & stop" training and discussion; entertaining stories that motivate and educate; and vignettes. Michael explains some of his most effective techniques in these programs, including terrific ways to listen better; modeling positive behavior; teaching young people to express feelings, solve problems, resolve disagreements, and handle mistakes, fears, stress and other strong emotions.